Translation: "Faithful to the end." Translation: "I hope to the last." Translation: "To the final end." Said to be the motto of the Canadian Space Agency. Relating to being at the end: The term ad finem; or its abbreviation, ad fin., is used at or near the end of a piece of writing. Without limit; indefinitely into the future; endlessly; describing something which goes on forever. Jonathan Swift, an English satirist born in Ireland (1667-1745), wrote: "So, naturalists observe, a flea hath smaller fleas that on him prey; and these have smaller still to bite ‘em; and so proceed ad infinitum." 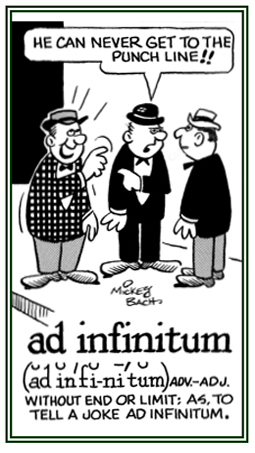 The term is often used interchangeably with ad nauseam and the original Latin sense is "beyond limits". 1. A feeling of closeness, understanding, and sympathy between people: Some classical musicians also have an affinity for jazz. 2. Family resemblance or a relationship by marriage: There was a special affinity between the two friends apparently because they were also cousins. 3. An inherent similarity between people or things: There is a close affinity between lemons and limes. Sarah felt an affinity with all of those who suffered because their pains were also her pains. 4. 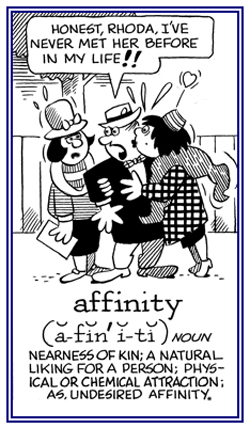 Etymology: Affinity comes from Latin affinitas, which means "kinship by marriage, as distinct from blood kinship". In the 18th century, naturalists started to use affinity to mean a family resemblance (as between cats and lions). 1. A natural liking or fondness for something or someone; a rapport: Many classical musicians have an affinity for jazz. 2. Family resemblance, similarity, likeness: There is a close affinity between lemons and limes. 1. Unlimited space, time, distance; extending beyond any measure or comprehension; without beginning or end: Beyond the Earth, astronomers have indicated there is only infinity. 2. In photography, a distance setting, as on a camera, beyond which the entire field is clearer and sharper: Tanya, the landscape photographer, set the lens on her camera to infinity so objects at a distance would be in focus. Carla seemed to have an affinity for photography; with careful precision, she set the aperture of the camera to infinity when taking long-distance shots. 1. To restrict or to limit the ability to move or to relocate; to stay in a specific location: The doctors tried hard to confine the spread of the new virus in order to protect the large population. The students were instructed to confine their written comments to just one page. 2. To keep or to cause a person to stay in something; such as, a bed or a wheelchair: After the accident, Morgan was confined to sitting in a wheelchair until his injured leg would get better. Referring to a space or an area that is restricted in size: Because of the shortage of hospital rooms, Fern had to stay in a confined section until a normal place became available. 1. The act or the fact of keeping someone or something within specific limits: The students were not happy about their confinement to the dormitory by the 9 p.m. curfew. 2. The time during which a woman gives birth, including the initial contractions: Trudy's sister stayed in a private clinic during her confinement when her daughter was born. Descriptive of something that can be explained, rationalized, or made clear: "Don't throw rocks" is a more definable explanation for a child than a long discourse about being kind and not hurting other people. Capable of being made clear or explained in a comprehensible manner: The doctor's presentation to the students was the most definably understood explanation of the disease than any which had been previously given. Pertaining to something in explicit, clear, rational terms: After much deliberation, the Board of Directors gave their definite response to the question from one of the employees: "Do not do it!" When something is definite, then it is unambiguous, exact, or undeniable. Done in a clear, precise, and comprehensible manner: The president of the university definitely stated that he would meet with the students over lunch to discuss their concerns. Related "end" units: term-, ultim-. Showing page 1 out of 5 pages of 70 main-word entries or main-word-entry groups.